The Assessment has identified 15 main sites and 44 additional sites. The implications are that as many of these sites as possible will be locked up for good. Due to breath hold limitations the vast majority of spearfishers are restricted to less than 20m of water on shallow reefs and headlands which are the main areas targeted (coastal waters). 5 of the primary sites that have been targeted are areas of great importance for spear fishers due to the safety aspect that they provide for new divers and experienced divers in adverse southerly or northerly weather patterns. These are Long Reef, North Head, Magic Point, Long Bay and Boat Harbour. 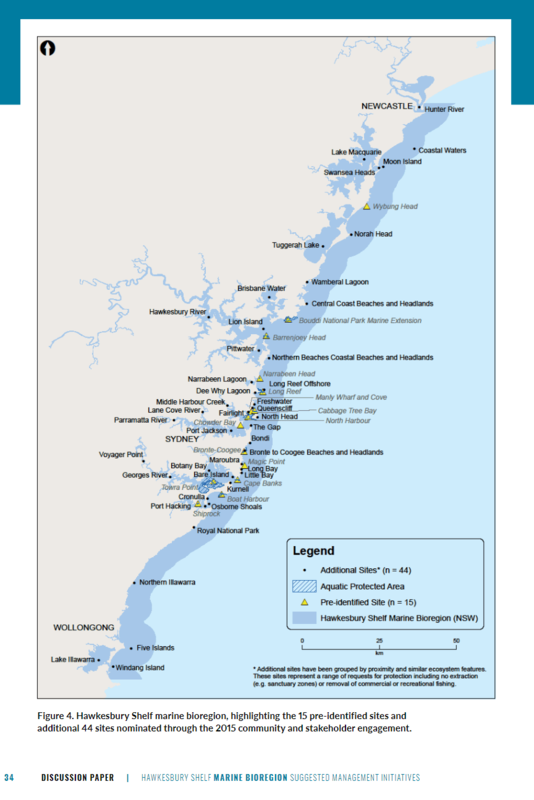 For the Illawarra spear fishers there is potential to lose all of the national park coastline, then the Northern Illawarra (this extends from north of Wollongong to the national park, then the five islands group and Windang Island. Locking out areas will see concentrated effort into the smaller areas left out which will see added fishing pressure on these sites that could possibly be detrimental to these unrestricted areas due to increased fishing pressures. Lock outs do not address the main issues of pollution, runoff, habitat destruction etc. Lockouts exclude the main user groups recreational fishers. Most fish species migrate in and out of these protected areas. The take (catch) by spearfishers is less than 0.1% of the total take (catch). Recreational Fishing (including spearfishing) is now regulated to an unprecedented degree with reviews of regulations at five yearly intervals. Over a period these reviews have resulted in far reaching changes being made to the Fisheries Management Act and Regulations. These regulations make extensive provisions for such matters as catch limits, gear restrictions, minimum legal lengths, protected species and closed or restricted areas. Adaptive management strategies which change due to the population levels of specific species. Seasonal closures to protect breeding aggregations. Increased enforcement and monitoring to ensure that the current management strategies that work well are even more effective. All spear fishers are strongly encouraged to make a submission and Have Your Say. “To enhance the conservation of biodiversity and use sharing through spatial management measures. 4A question: What do you see as the strengths of this proposed initiative to maximise the benefits you receive from the marine estate? 4A Answer: I don't see any strengths from the proposed initiative as it aims to exclude recreational spearfishers and line fishers permanently from these areas. 4B question: What do you see as the weakness of this proposed initiative to maximise the benefits you receive from the marine estate? 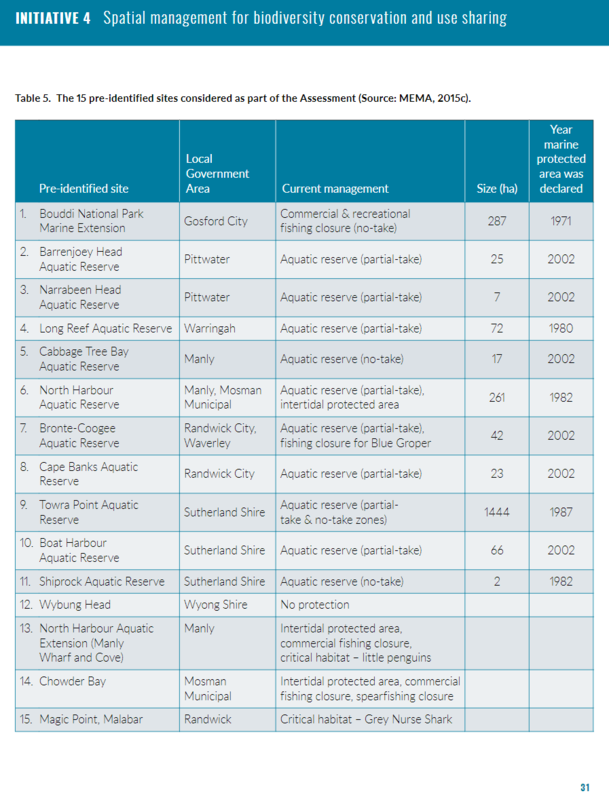 Recreational spearfishers will be locked out of these areas permanently despite spearfishing being recognised as having a minimal to low impact as shown in the TARA (Threat and Risk Assessment) report. Due to breath hold limitations spearfishers will be severely restricted in where they can dive. Effort will be concentrated into the remaining areas which could be detrimental. Spearfishers will be forced to dive more dangerous conditions and be put at risk due to losing the important protection provided by some of the larger headlands such as Long Reef, North Head, Sth Maroubra, Long Bay and Boat Harbour. This assessment should be about maintaining and improving access not denying it. SCUBA divers are not mentioned and will still get full access despite their interactions with grey nurse sharks, depletion of sea urchins around dive sites used to feed fish especially blue groper, and the damage done to the sea bed from poor buoyancy adjustments. Many fish species will migrate in and out of these areas. 4C Question: What changes would make this proposed initiative more effective at addressing the priority threats (and why)? As a spearfisher I do not believe in this initiative at all. Spearfishing is rated by MEMA’s TARA to be considered not applicable/minimal/low to Marine habitats and assemblages, it is not a priority threat whatsoever. If there are concerns on fish stocks State Fisheries should be looking at alternative management options rather than total permanent lockouts. Adjusting current bag and size limits if needed. "I'm a passionate conservationist. I've worked full time for an environmental group in the past. But I'mappalled at the ideologically driven attacks on the rights of fishers - spearfishers in particular - to pursue their sustainable and highly selective sport. As freediving spearfishers, we can only access a tiny, shallow area of the coastal fringe. Most divers can't get deeper than 15m or so. This dramatically limits the area we can safely access. We need to be in close contact with a fish before we're able to spear it - no more than 2-4m at most. This means we can easily identify the species and size of the fish and judge whether it's legal to harvest. We have eyes on the fish! We're not catching undersize fish on hook and line. If anything spearfishing should be encouraged over other methods for it's selectivity and environmental integrity. Ever tried freediving? It's extremely difficult. Ever tried to get close enough to a fish to spear it? That's a whole other flavour of challenging. Most of our critics have no understanding of the sport, it's ethics and unique skill requirements. Many have no real relationship with the ocean beyond extreme green media posturing. We are a small but significant minority, practicing an ancient fishing method that few will ever truly master. There are no guarantees of success, we catch far less per person than line fishers and there are fewer of us. And yet we're cast as vandals by people who have no understanding of our way of fishing. Moves to further exclude spearfishers from the Sydney area are just plain unfair and scientifically unsound." Spearfishing is a selective and sustainable method of harvesting seafood, it sees no bycatch. The spearfisher is restricted to the capacity of their own breath hold and mental fortitude that sees them descend below the surface of the sea on a single breath in shallow water to procure their catch. The mantra of spearfishers is “safe, selective sustainable” Spearfishers are restricted to shallow coastal waters on the whole due to physical limitations. The USFA is of the opinion that sanctuaries and lock outs are merely a feel good option for the non-extractors of the resource. Spearfishing responsibly is a most sustainable way to harvest a meal. Spearfishing poses no threat as is confirmed by MEMA’s TARA. NSW Fisheries manages the resource with quotas, seasonal restrictions, Intertidal Protected Areas, and has bag and size limits in practise. By further excluding spearfishers from dive-able grounds denies safe access in varying weather conditions and will prohibit the young, elderly, inexperienced and new spearfishers entry to this healthy activity; further restricts our already small area to dive as we are physically limited to shallow coastal waters and reefs on the whole; will no doubt increase extraction pressure on areas that will remain open to fishing, and with this issue the possibility of altercations with other user groups now concentrated in an area from our massive population area. You can further support your spearfishing rights and future by joining the USFA so that we have a larger voice. Not only will you have a voice but with your membership you will receive free automatic insurance coverage. This is valid worldwide, every time you dive with another member. Click this link to show your support for spearfishing in NSW by signing up to the USFA today. We have a greater voice with greater numbers. Receive immediate cover and be given up to date notifications on issues that concern spearfishing.